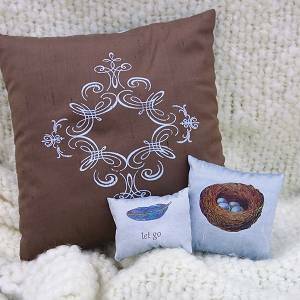 Silk-screened scroll work, songbirds and nature are featured in this collection of all silk pillows designed by Oregon artist, Peggy Flynn. Her work has been picked up by major national department stores and resorts, but you can get them here at a great price. The reverse sides of the pillows are complementary solid colors in cocoa, ice blue and ivory. Pillows are plump with Lavender, and the fresh essential oils of Clary Sage, Vetivert and Spring Lemongrass. Designed and made in Oregon. Copyright © 2005-2019 Cottage Catalog.